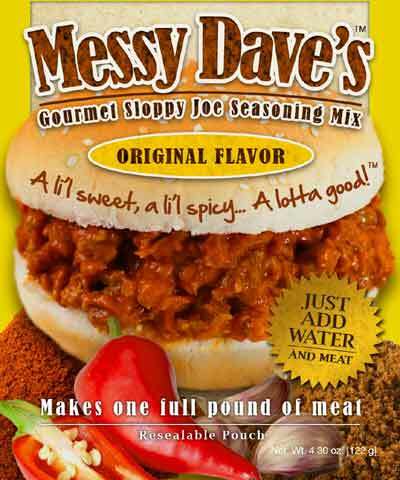 Messy Dave’s is a complete Sloppy Joe dry seasoning mix of natural ingredients – Nothing artificial and No preservatives! All you need is ground meat; Messy Dave’s and water! Use with any ground meat; beef, chicken, turkey, pork, ham, venison, bison. You can even use vegetable protein in place of meat! Messy Dave’s Gourmet Sloppy Joe Seasoning Mix is available in Original and Mild flavors. A li’l sweet, a li’l spicy…A lotta good! Resealable pouch allows you to make from one sandwich to eight sandwiches!